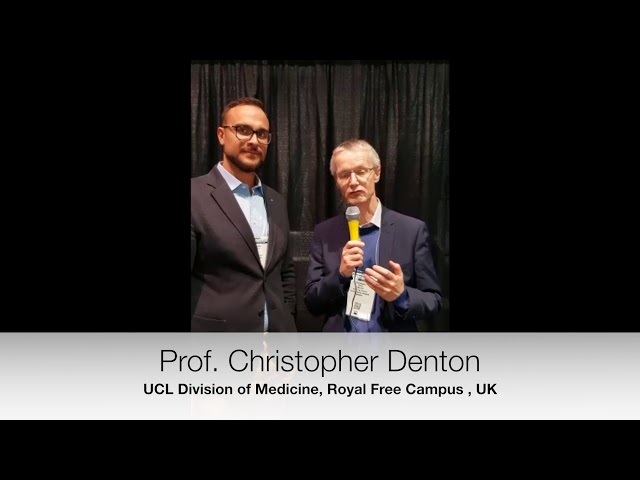 Prof. Christopher Denton interviewed at ACR2018 on Tocilizumab in SSc. 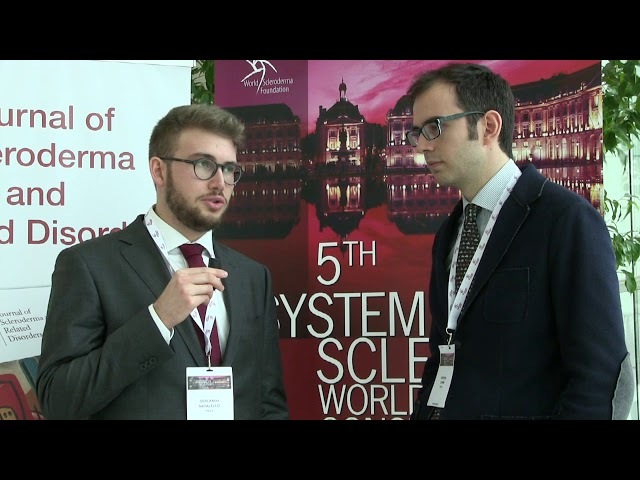 Dr. Cosimo Bruni, EUSTAR Young Investigators member, interviewed Prof. Christopher Denton​ on Tocilizumab in SSc. Prof. Daniel E. Furst interviewed on Pregnancy in SSc: A systematic review and meta-analysis. 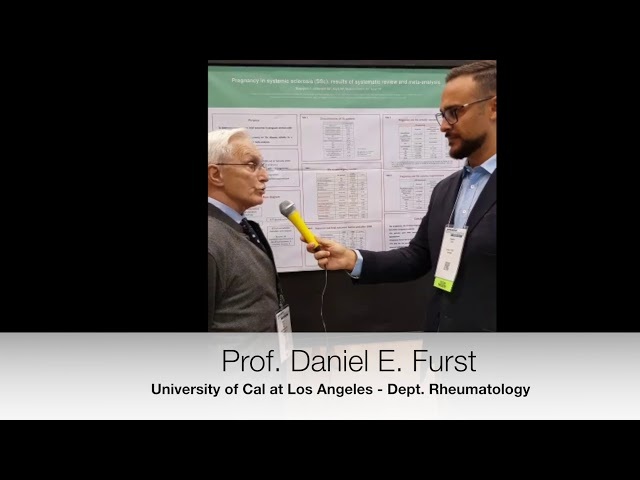 Dr. Cosimo Bruni, EUSTAR Young Investigators member, interviewed Prof. Daniel E. Furst on pregnancy in SSc: a systematic review and meta-analysis. 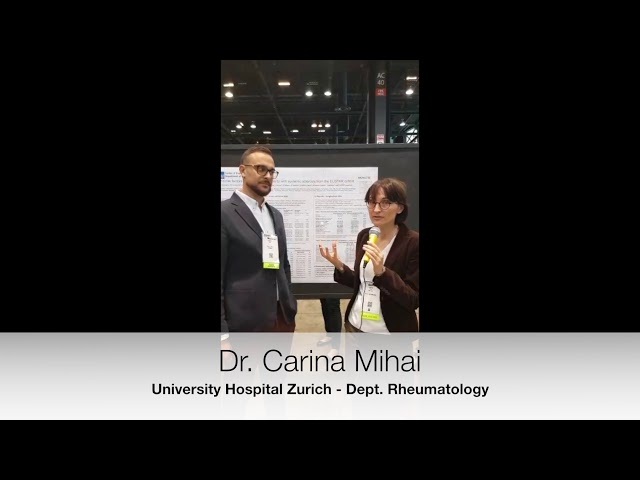 Dr. Carina Mihai interviewed on the incident and risk factors for gangrene in patients with SSc. 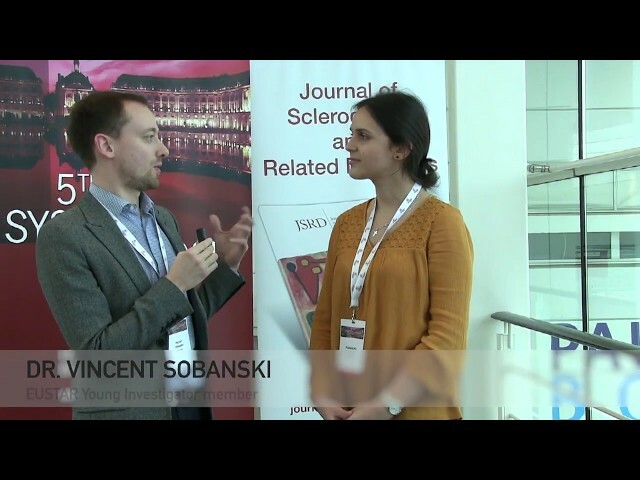 Dr. Cosimo Bruni, EUSTAR Young Investigators member, interviewed Dr. Carina Mihai on the incident and risk factors for gangrene in patients with SSc from the EUSTAR cohort. 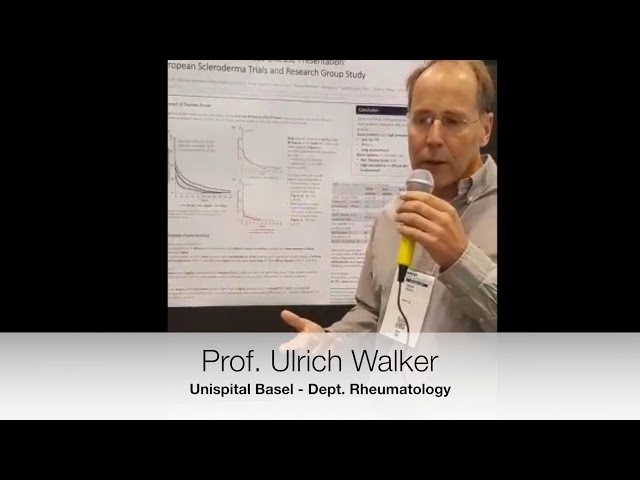 Prof. Ulrich Walker interviewed at ACR18 on racial differences in SSc an EUSTAR study. Dr. Cosimo Bruni, EUSTAR Young Investigators member, interviewed Prof. Ulrich Walker on racial differences in SSc, an EUSTAR study. 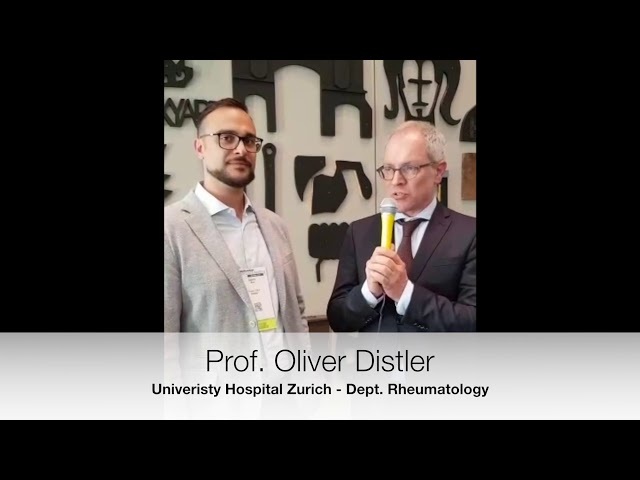 Dr. Cosimo Bruni, EUSTAR Young Investigators member, interviewed Prof. Oliver Distler on the results of Riociguat in SSc. 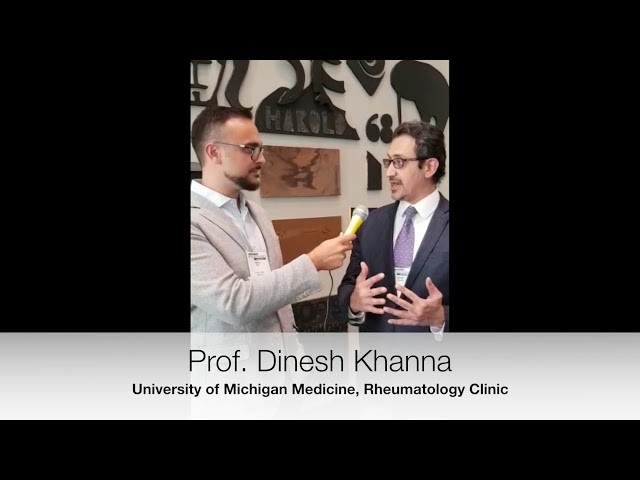 Prof. Dinesh Khanna Interviewed on the results of the Abatacept in SSc. Dr. Cosimo Bruni, EUSTAR Young Investigators member, interviewed Prof. Dinesh Khanna on the results of Abatacept in SSc. 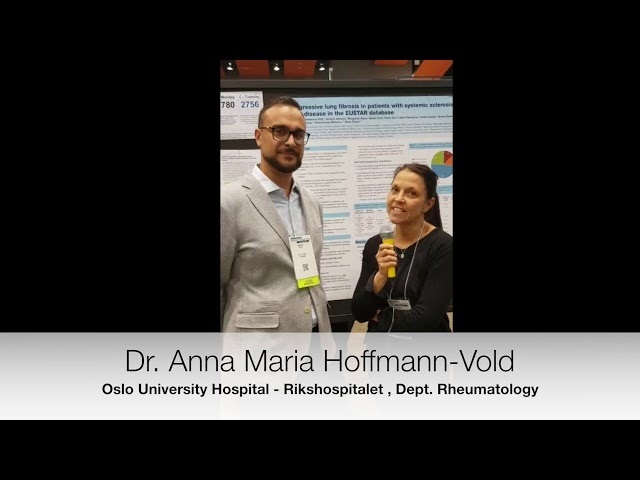 Dr. Cosimo Bruni,​ EUSTAR Young Investigators member, interviewed Dr. Anna Hoffmann-Vold on Progressive lung fibrosis in patients with Systemic Sclerosis- associated interstitial lung disease in the EUSTAR database. 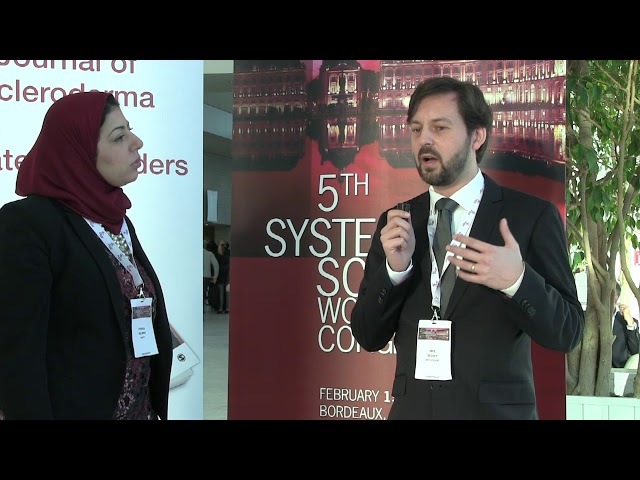 Dr. Yossra Atef Suliman, EUSTAR Young Investigators member, interviewed Dr. Cosimo Bruni on ILD in SSc with oral versus intravenous cyclophosphamide: preliminary efficacy and safety data from 2 randomized clinical trials and 1 registry. 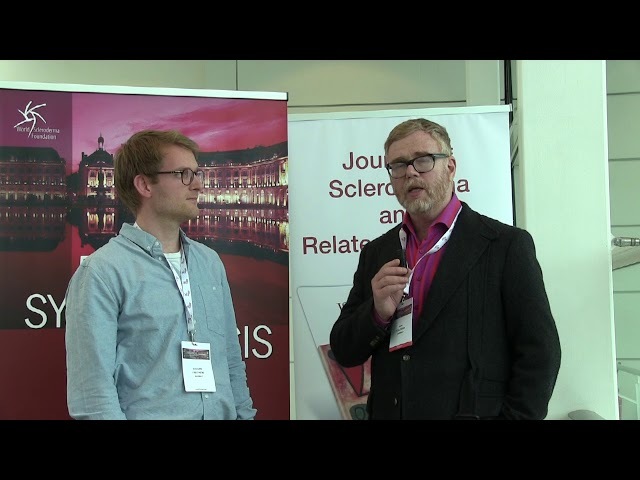 Prof.Oliver Distler Interviewed on Anti-U1RNP Antibodies: A EUSTAR Analysis. 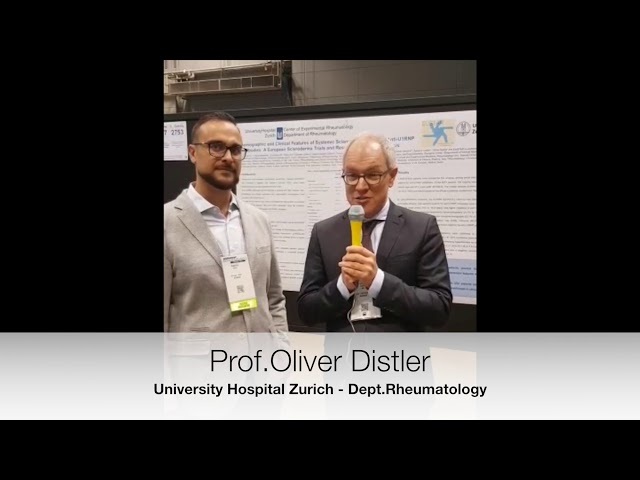 Dr. Cosimo Bruni, EUSTAR Young Investigators member, interviewed Prof. Oliver Distler on Demographic and Clinical Features on Systemic Sclerosis Patients with Anti-U1RNP Antibodies. 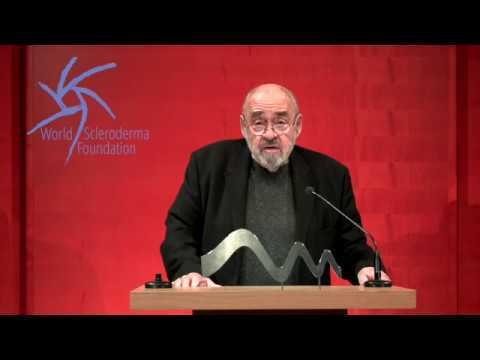 Alexandre Klee's , World Scleroderma Foundation Patron, speech at SSc World Congress opening ceremony held in Bordeaux , France! Dr. Esmeralda Recalde, WSF Executive Secretary, interviewed Prof. Martin Beappler - Prof. Thomas Krieg - Dr. Yoshihide Asano -Dr. Ami Shah for the Edith-Busch Prize. 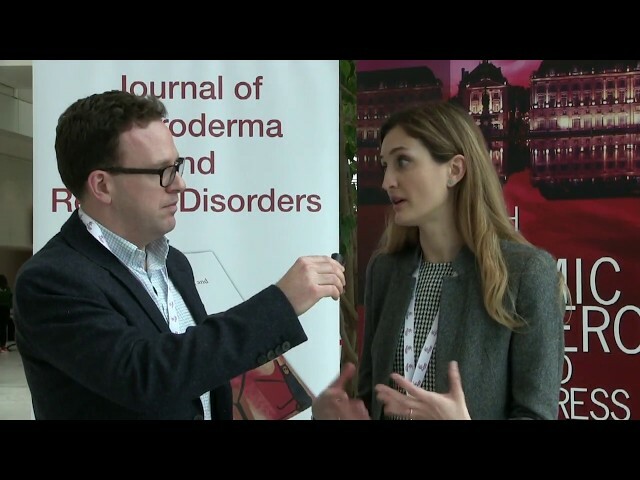 Dr. Maria Grazia Lazzaroni, EUSTAR Young Investigator member, interviewed Prof. Marco Matucci Cerinic on the use of macro/micro vascular assessment when you see a DU. 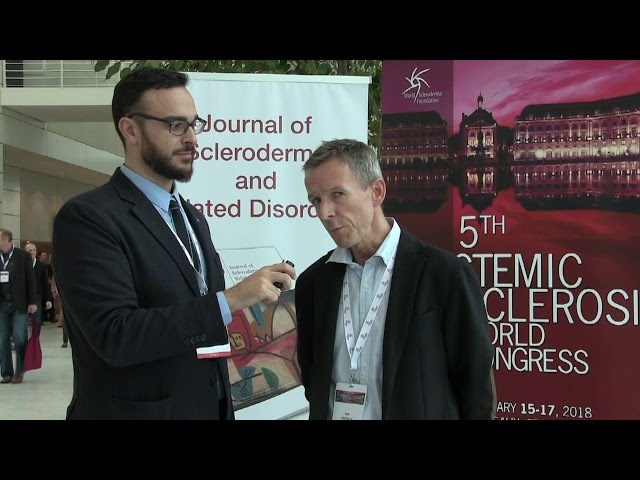 Dr. Cosimo Bruni, EUSTAR Young Investigator member, interviewed Prof. Eric Hachulla on DU lessons and perspectives from RCT. 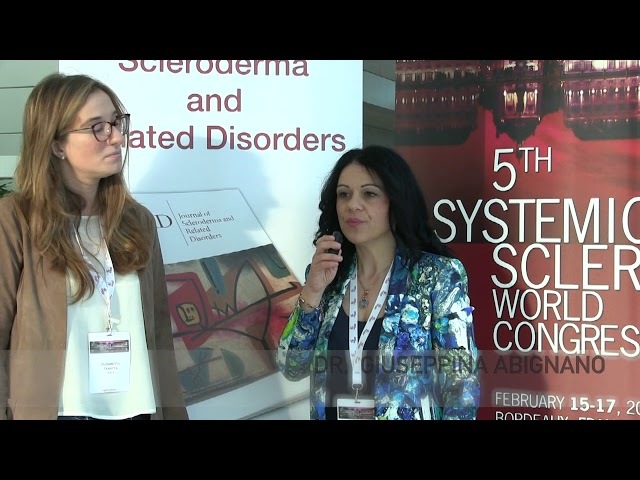 Dr. Eugenia Bertoldo, EUSTAR Young Investigator member, interviewed Prof. Shervin Assassi on the treatment with myeloablatation followed by autologous stem cell transplantation normalizes the SSc molecular signature. Dr. Vincent Sobanski, EUSTAR Young Investigator member, interviewed Dr. Rucsandra Dobrota on the news on skin-biopsy. 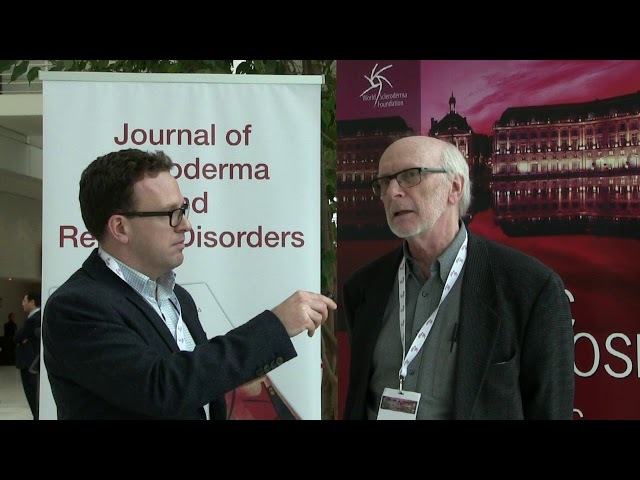 Dr. John Pauling, EUSTAR Young Investigator member, interviewed Prof. Murray Baron on myositis. Dr. Jorge Juan Gonzalez Martin, EUSTAR Young Investigator member, interviewed Dr. Elena Lopez-Isac on deciphering the genetic background of SSc through a meta-gwas strategy. 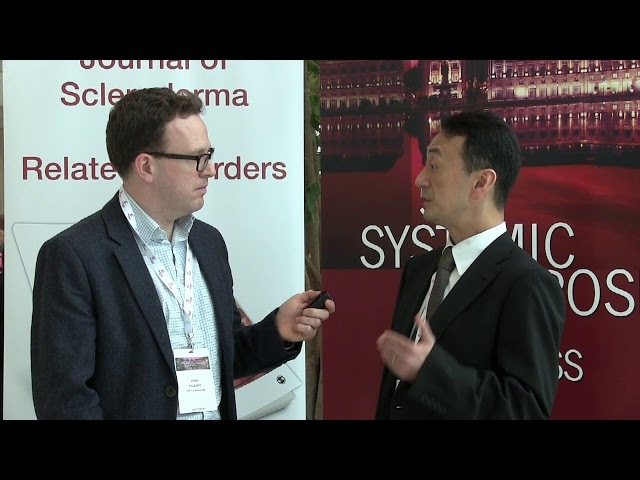 Dr. John Pauling, EUSTAR Young Investigator member, interviewed Prof. Masa Kuwana on the study regarding therapy combination of Ambrisentan and Tadalafil in connective tissue disease associated pulmonary arterial hypertension (CTD- PAH) in the modify intention to treat population. Dr. Cosimo Bruni, EUSTAR Young Investigator member, interviewed Prof. Dinesh Khanna on juvenile aspects in SSc. 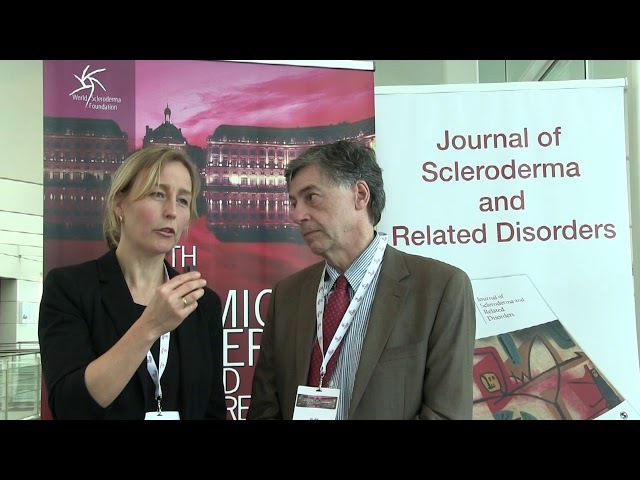 Dr. Rucsandra Dobrota, EUSTAR Young Investigator member, interviewed Dr. Sophie Jung on the SCLERORAL study: clinical and radiological analysis of oral manifestations associated to SSc. 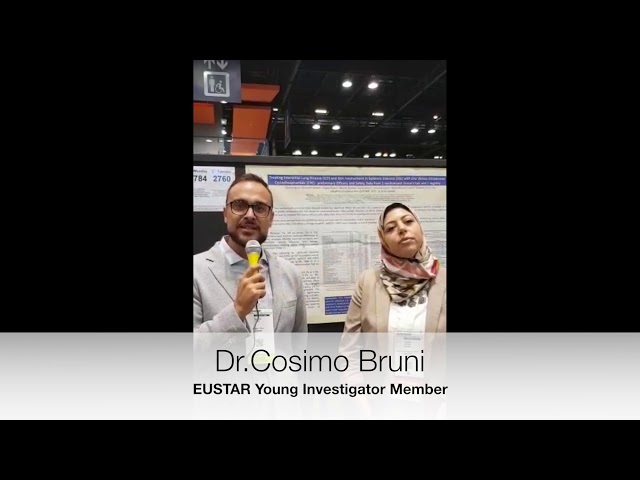 Dr. Cosimo Bruni, EUSTAR Young Investigator member, interviewed Prof. Yannick Allanore on the EUSTAR registries. 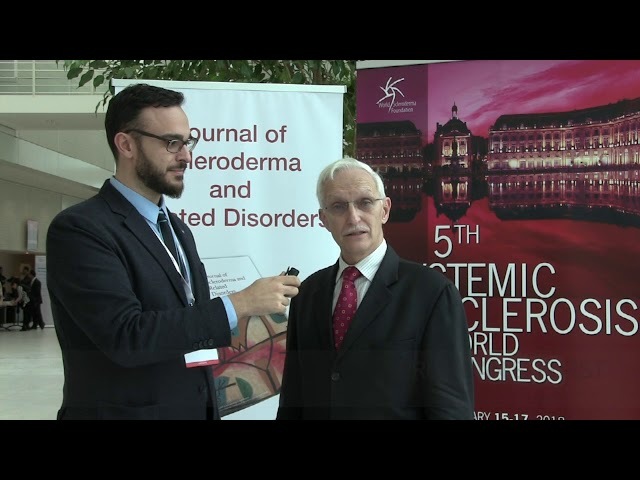 Dr. Cosimo Bruni, EUSTAR Young Investigator member, interviewed Prof. Daniel E.Furst on the strengths and weaknesses of MRSS as a skin outcome measuring in Scleroderma. 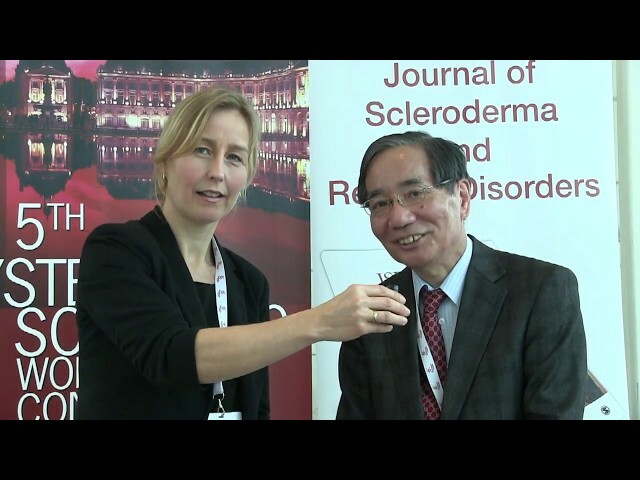 Dr. Dr. Jeska De Vries-Bouwstra, EUSTAR Young Investigator member, interviewed Prof. Kazuhiko Takehara on the advances of localized scleroderma. 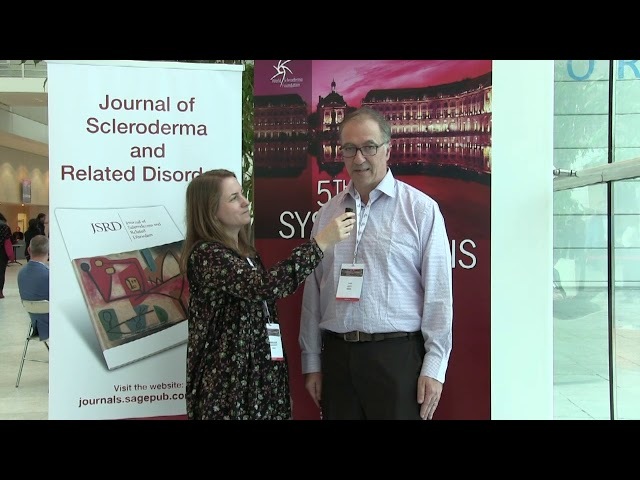 Dr. Dr. Jeska De Vries-Bouwstra, EUSTAR Young Investigator member, interviewed Dr. Alain Taieb on topical and systemic therapy. Dr. Cristian Caimmi, EUSTAR Young Investigator member, interviewed on the microbiota in SSc. 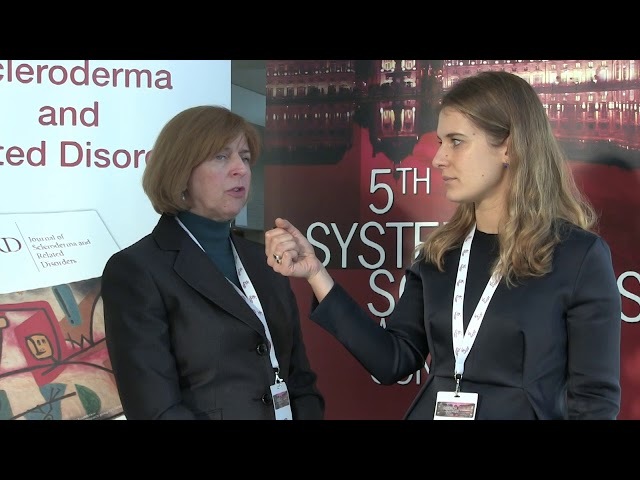 Dr. Eugenia Bertoldo, EUSTAR Young Investigator member, interviewed Dr. Maureen O'Connor on the development of AVID200, an isoform-selective TGF-BETA inhibitor, for the treatment of SSc. 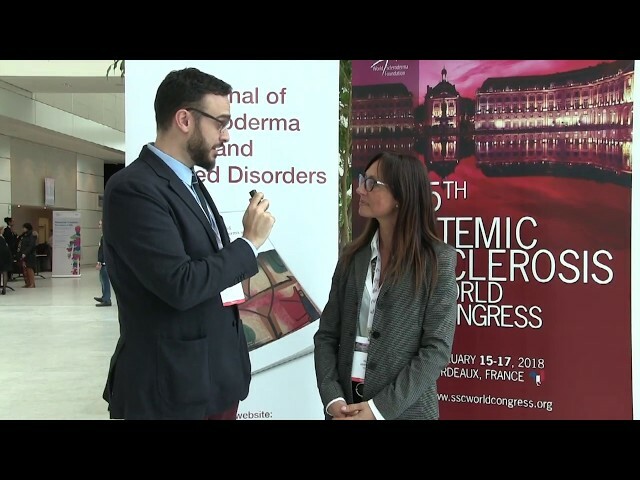 Dr. Cosimo Bruni, EUSTAR Young Investigator member, interviewed Dr. Dilia Giuggioli on the assessment of the ulcer (characteristics of the wound,infections, gangrene) in SSc. 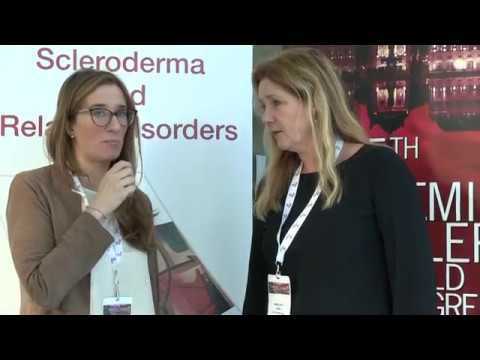 Dr. Elisabetta Zanatta, EUSTAR Young Investigator member, interviewed Dr. Kate Durgin Kolstad on the low level of CXCL5 and CCL5 correlate with incident pulmonary arterial hypertension in patients with SSc. 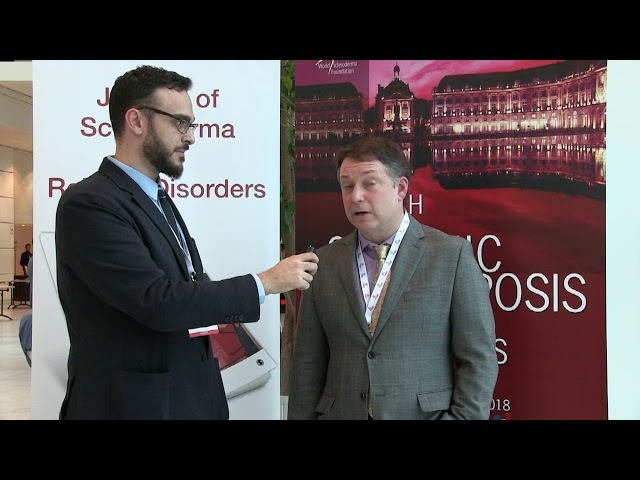 Dr. Håvard Fretheim, EUSTAR Young Investigator member, interviewed Dr. Ivan Foeldvari on the development of outcome measurements in juvenile SSc. Dr. Cosimo Bruni, EUSTAR Young Investigator member, interviewed Prof. Carlo Ventura on Mesenchymal cells in tissue repair, regeneration and fibrosis. 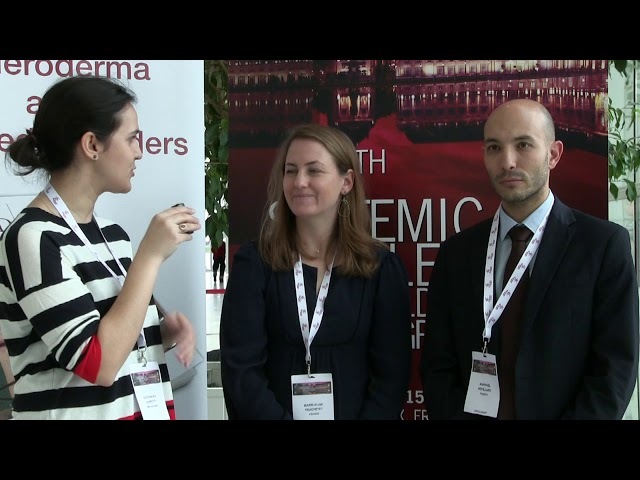 Dr. Rucsandra Dobrota, EUSTAR Young Investigator member, interviewed Dr. Marie Elise Truchete & Dr. Raphaël Devillard on oral maxillary involvement in SSc. 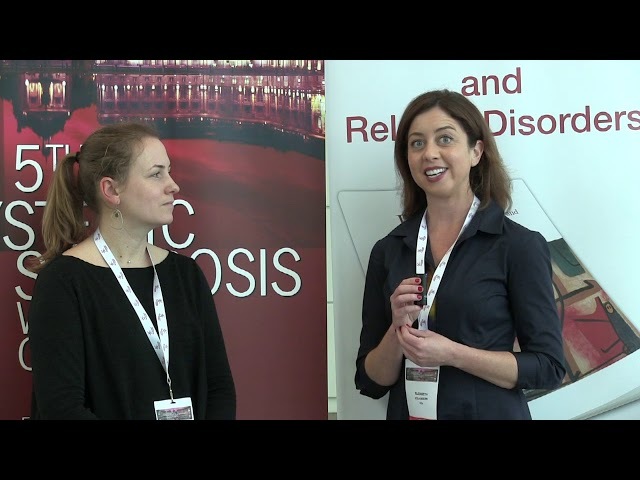 Dr. Michele Iudici, EUSTAR Young Investigator member, interviewed Prof. Susanna Proudman on the Australian registries. Dr. Rucsandra Dobrota, EUSTAR Young Investigator member, interviewed Dr. Gianluca Bagnato on the predictor of malnutrition in SSc score, PREMASS: the first validated combined index predictive of future weight loss in SSc. Dr. Cosimo Bruni, EUSTAR Young Investigator member, interviewed Dr. Michael L. Whitfield on multi-organ RNA-sequences of patients with SSc finds that intrinsic subsets are conserved across organ systems. 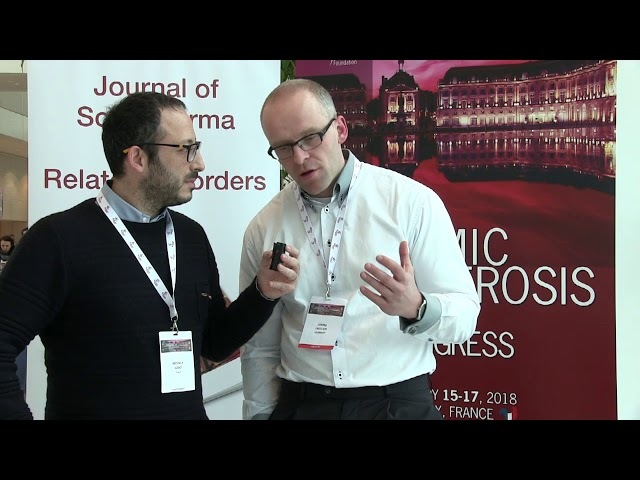 Dr. Cristian Caimmi, EUSTAR Young Investigator member, interviewed Dr. Gerlando Natalello on how intestinal involvement in SSc is characterized by a peculiar gut microbiota: correlation with disease subtypes and BMI. 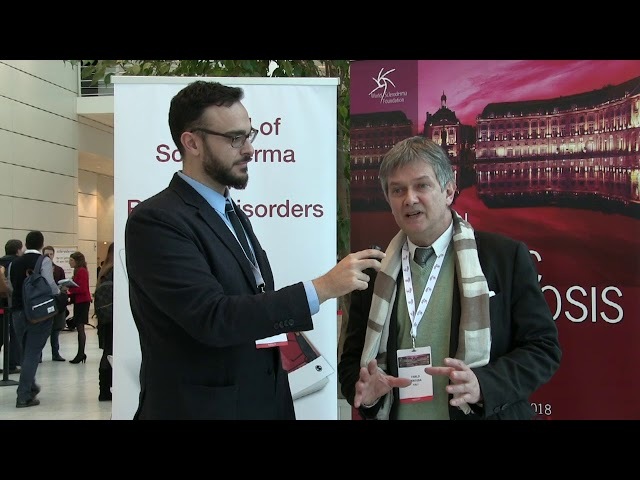 Dr. Elisabetta Zanatta, EUSTAR Young Investigator member, interviewed Prof. Medelon Vonk on the prediction of organ involvement and survival in patients with SSc in the first 5 years from diagnosis. 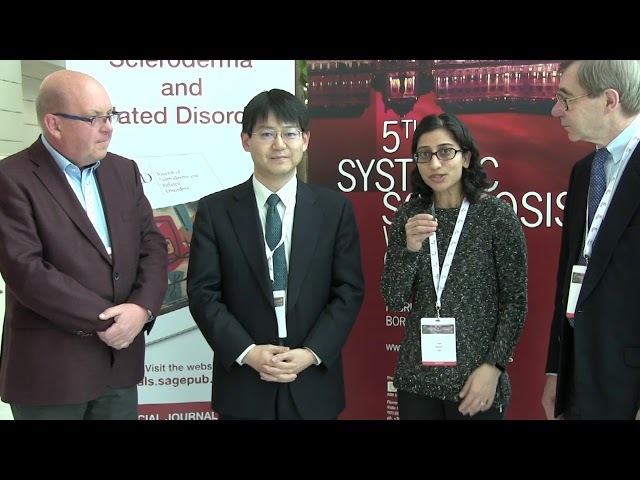 Dr. Yossra Atef Suliman, EUSTAR Young Investigator member, interviewed Dr. Dr. Mike Becker on the predictors for disease worsening defined by organ failure in diffuse SSc. 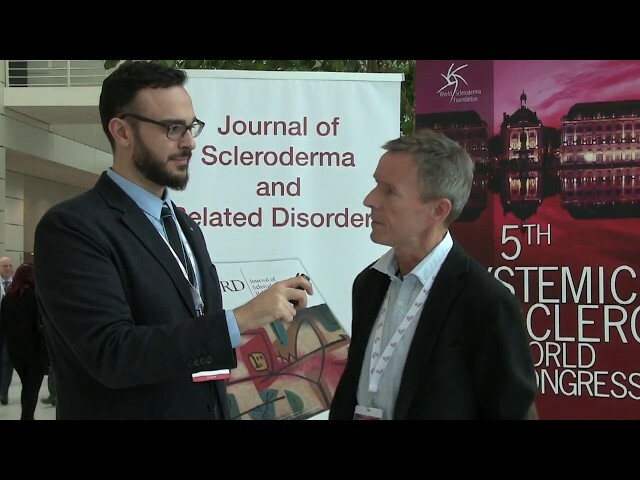 Dr. Cosimo Bruni, EUSTAR Young Investigator member, interviewed Prof. Donald Tashkin on the management of Dispnia in SSc. 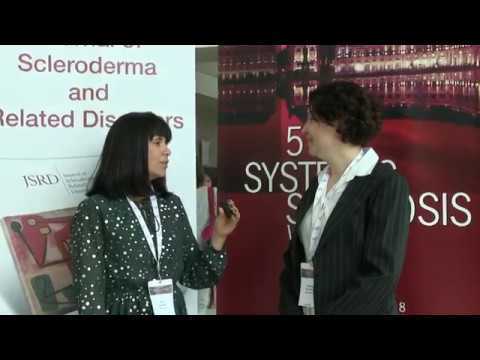 Dr. Ines Cordeiro, EUSTAR Young Investigator member, interviewed Dr. Svetlana Nithyanova on dynamic prediction of pulmonary hypertension in SSc using landmark analysis. Dr. Eugenia Bertoldo, EUSTAR Young Investigator member, interviewed Prof. Shervin Assassi on the USA press registries. 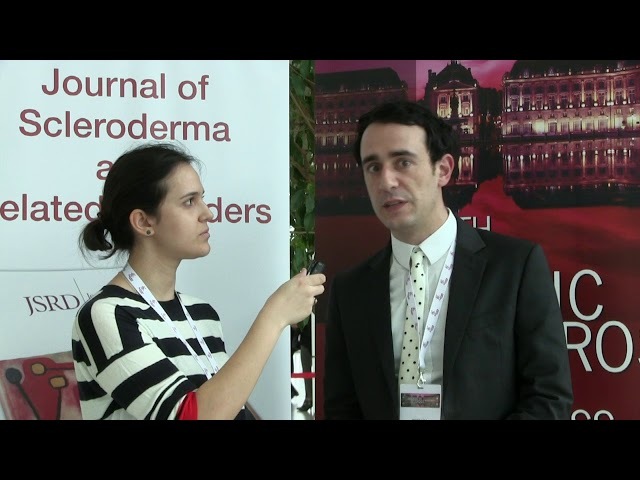 Dr. Marie-Elise Truchetet, EUSTAR Young Investigator member, interviewed Prof. Yair Levey on IVIG biologic for SSc. 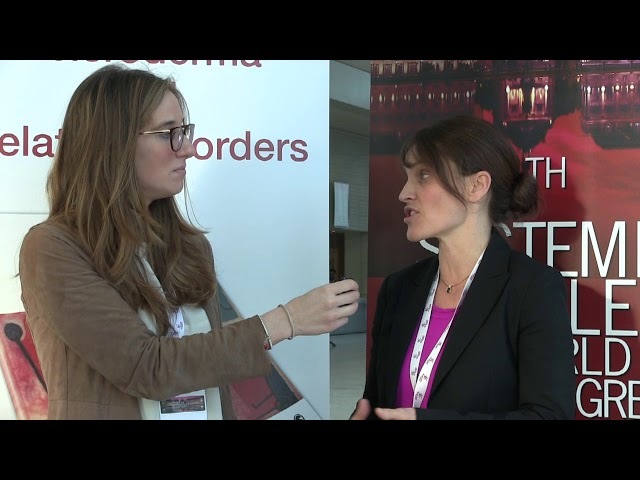 Dr. Elisabetta Zanatta, EUSTAR Young Investigator member, interviewed Dr. Giuseppina Abignano on microvascular flow assessed by dynamic optical coherence tomography. 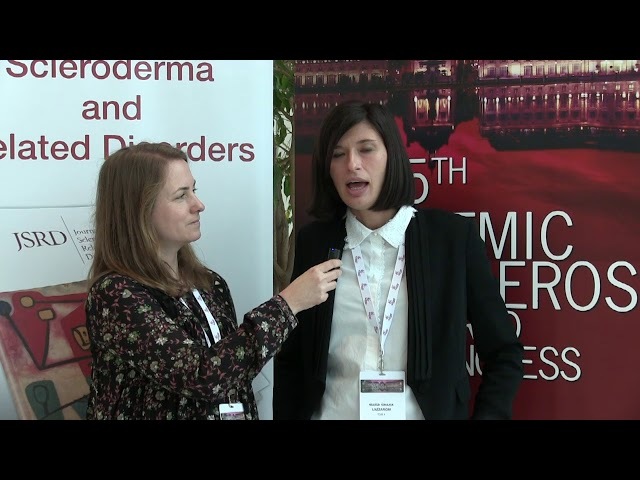 Dr. Marie - Elise Truchetet, EUSTAR Young Investigator member, interviewed Dr. Maria Grazia Lazzaroni on RNA Pol III antibody. 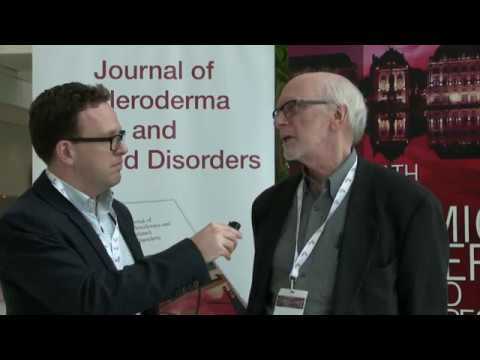 Dr. John Pauling, EUSTAR Young Investigator member, interviewed Prof. Murray Baron on the Canadian scleroderma research group. Dr. John Pauling, EUSTAR Young Investigator member, interviewed Dr. Luna Gargani on Echocardiography beyond PAH. 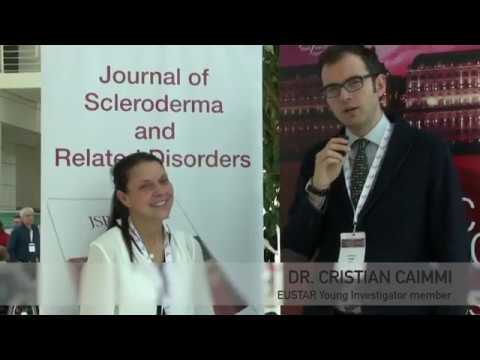 Dr. Cosimo Bruni, EUSTAR Young Investigator member, interviewed Prof. Eric Haculla on the EUSTAR contribution in promoting the education of young rheumatologists in SSc. 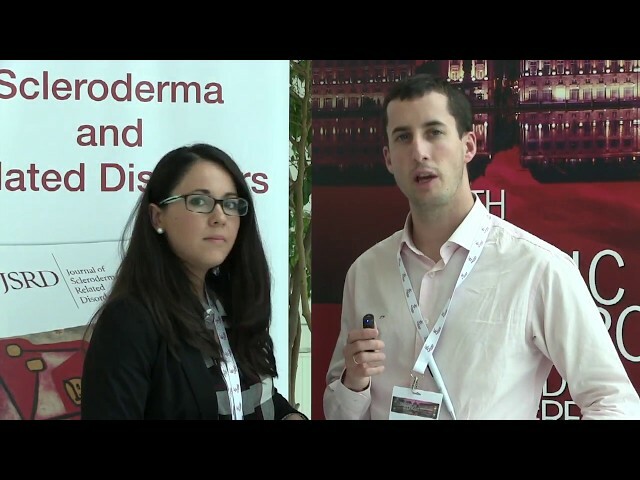 Dr. Maria Grazia Lazzaroni, EUSTAR Young Investigator member, interviewed Dr. Cosimo Bruni on the topical treatment strategy in DU. 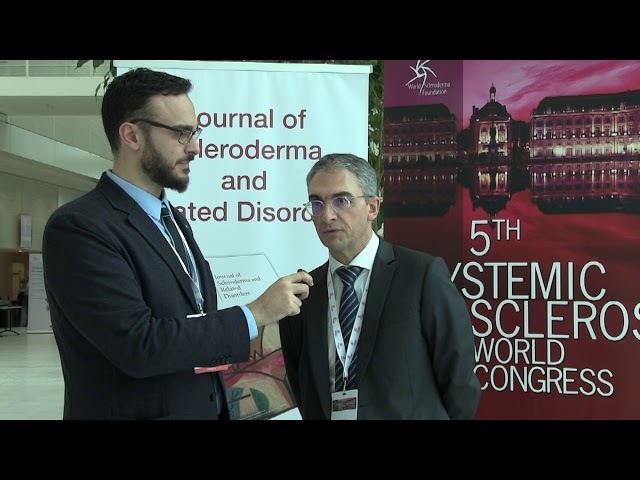 Dr. Michele Iudici, EUSTAR Young Investigator member, interviewed Prof. J Distler on fibrosis in SSc: causes & consequences.